We’ve mentioned before how SEO is, in many ways, a branch of digital marketing. While SEO is often more technical, focusing on keyword analysis and the creation of relevant content, there is still something to be said for general brand recognition and respect. Even with a great optimisation strategy, people are always aware of brand recognition. This is especially true online, when news and rumours can quickly spread across social media. 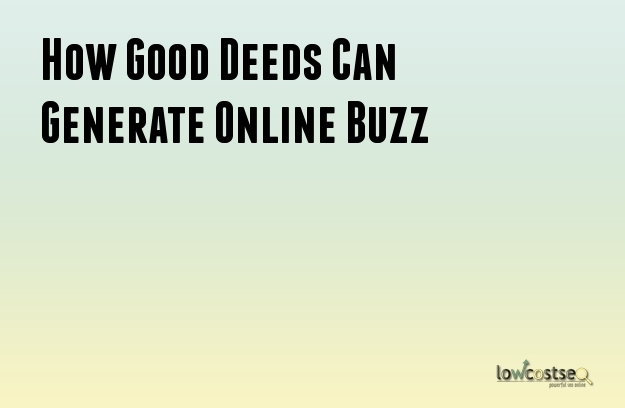 With this in mind, then, how effective are the good deeds you do and how can they generate the right kind of buzz? From an SEO point of view, the way big companies reacted to Hurricane Matthew was very interesting. As this MOZ study shows, some brands responded with kindness, while others did not. Yet the response from social media is very clear. When you have platforms such as twitter – where users can be very loud and direct in their responses – as well as services such as Yelp for longer reviews (and score based systems), such opinions will quickly matter. People like to share stories, good or bad. Yet a passionate and unique story will, arguably, make it’s own attention. Looking at the MOZ study again, one thing should be subtly clear. Of the two companies being looked at, only the ‘good’ company gets a link. This is a case of company policy, but many websites operate like this. Other example news stories, like this, follow suite, not linking to respective businesses. Why? Because many platforms – especially blogs – take great care and pride over their content, recognising the value of links. Just as any links used in outreach have to provide value and interest, many webmasters actively refuse to give links to organisations or companies they don’t support, or actions they do not approve of. While the above examples focus around a widely recognised event, there’s no reason why this can’t work on a local scale. A smaller company might not have the resources to do much, but it can still get itself known on a smaller scale. This is why many people choose to do special promotions or support local organisations. While it doesn’t make the biggest headlines, it can still get picked up by local newspaper sites, other business blogs and the social media of active residents. While this isn’t going to offer the biggest SEO benefits in terms of ranking factor, it will appeal to users in the area, which is one of the most vital aspects of improving your local SEO. Going back to the first point, you can also consider the implications of using more negative actions. It’s well known that Google can highlight news articles and ensure relevant, topical information is available. Yet many also question if Google is biased towards content that negatively influences a brands reputation. Whether this is true or not, the need to be aware of one’s actions and how they can be seen online is certainly highly crucial. When social media and review services start to have a poor reaction to your brand, this will trickle down to a local level. People searching for businesses by town or country, for instance, may very well read the first reviews that come up and with Google Penguin looking to make its results more and more relevant (especially on mobile platforms) this is something that can hinder companies moving forward.